May 13th, 2017 – There are currently bills before the Texas Legislature that would allow access to adult stem cell therapy in the State of Texas, rather than by travelling outside of the U.S. This week advocacy members of Patients For Stem Cells testified before the Texas House of Representatives in support of these bills, and we are happy to report House Bill 810 by Rep. Tan Parker, passed the Texas House with 150 yes votes and zero no votes. An emotional speech by Rep. Drew Springer, R-Muenster, about his wife’s need for a medical cure from stem-cell research, brought together this unanimous, bi-partisan vote. Now the Texas Senate needs to hear from their Texas constituents! The next step is the Senate vote, and we have advocates at the Capitol who will deliver your testimony. 2. Why you think adult stem cell therapy should be allowed in Texas. Maybe you or a loved one has a terminal or chronic condition that could be treated by stem cells. Or you just want to support medical freedom. 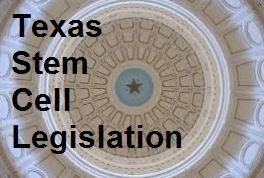 Please click here to find your Senator and also call to express your support for the HB 810 stem cell bill. For everyone who doesn’t live in Texas, rest assured that this legislation may well start a trend for other States to follow. We will keep you informed as this movement expands, and look forward to your participation! Please use the share buttons below to get the word out. Want to become a member of Patients For Stem Cells? Just subscribe to our blog! This entry was posted in Take Action and tagged adult stem cells, medical freedom act, regenerative medicine bill, right to try, Texas HB 810, Texas stem cells on 05/14/2017 by patients.